The northern end of the walkway is not very obvious when seen from SH30, and is easily missed. 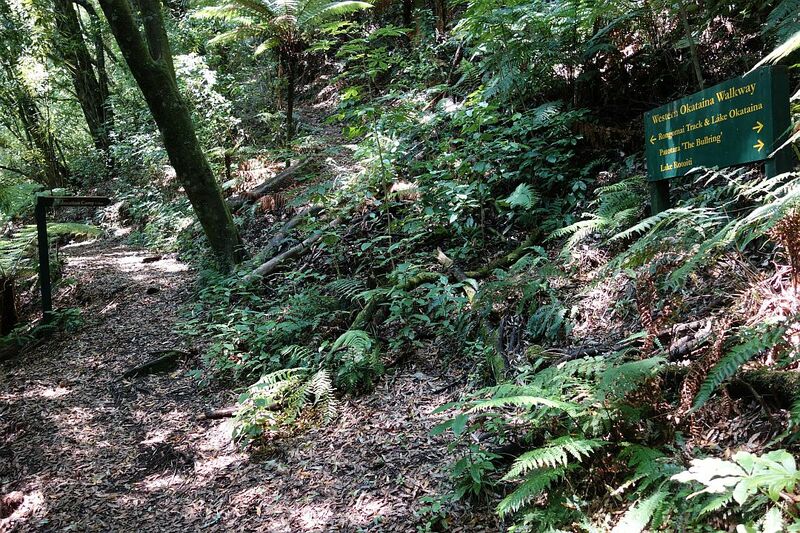 Especially if the sign is overgrown or partly covered with vegetation, as it was today. 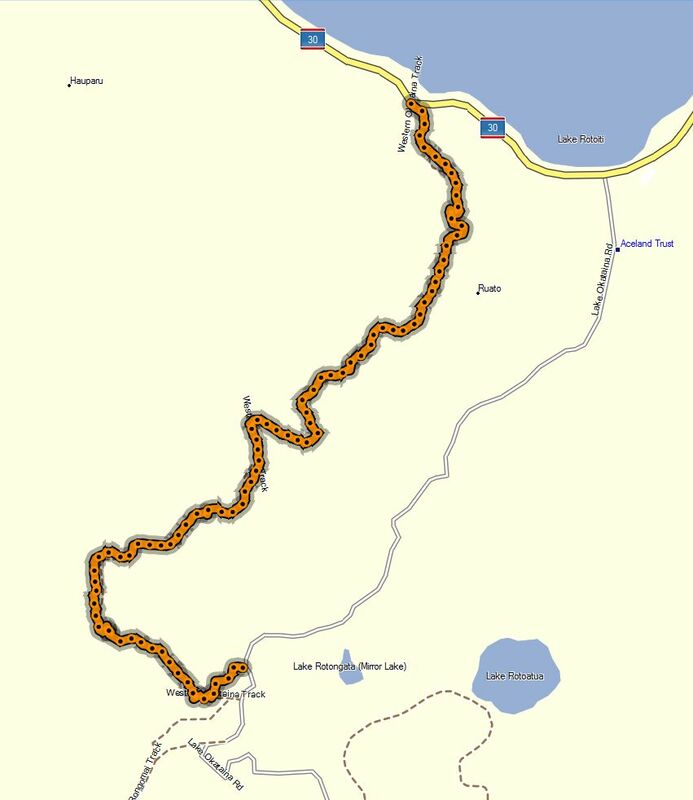 There is only parking space for 2 or 3 vehicles at the start, but there are nearby areas on SH30 where it’s possible to park. The track start is about 850m west of Okataina Rd. There are no toilet facilities anywhere on this part of the track. The track consists mostly of an old, disused forestry track. 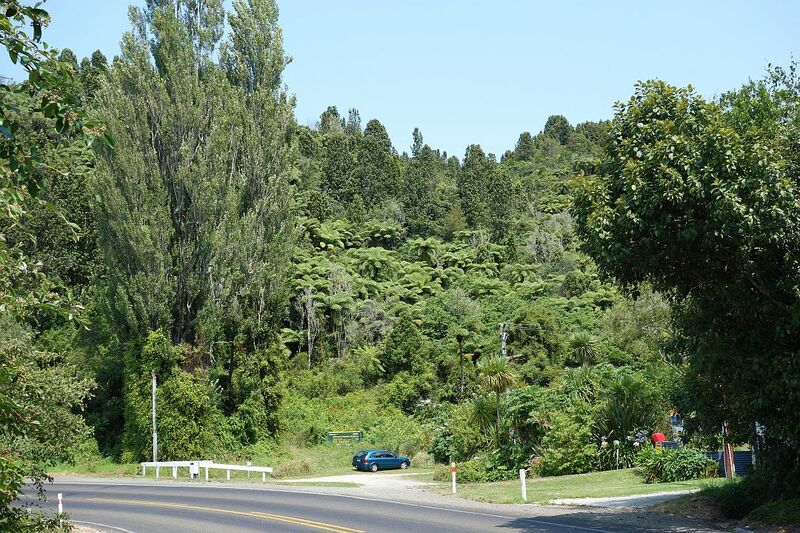 It climbs quite steeply from SH30 before following the ridgeline for some time before descending to the Patotara crater and the Okataina Road. The steeper parts of the track are mostly clay soil, and would be slippery when wet. 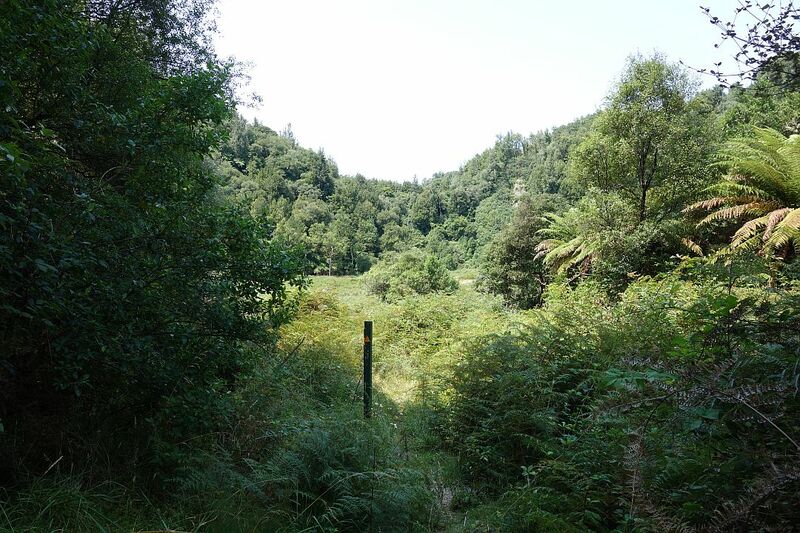 The track crossing the crater is partially covered with shoulder-high bracken, blackberry and grass, and would be uncomfortable to traverse when wet. Lake Rotoiti and SH30 near the northern end of Okataina Rd. 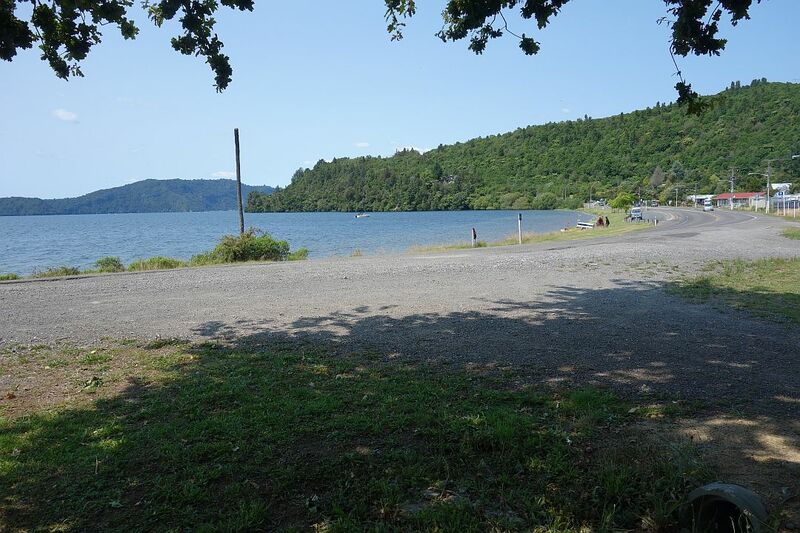 There is a parking area here, about 600m from the start of the walkway. The start of the Okataina Western Walkway seen from SH30. The sign marking the start can be seen above the parked vehicle. 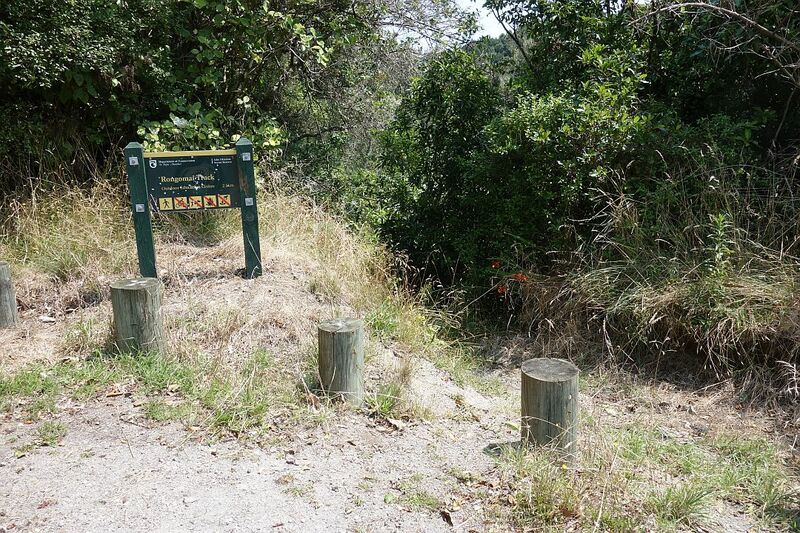 The sign marking the start of the walkway, showing 4.1km to the Patotara exit point. 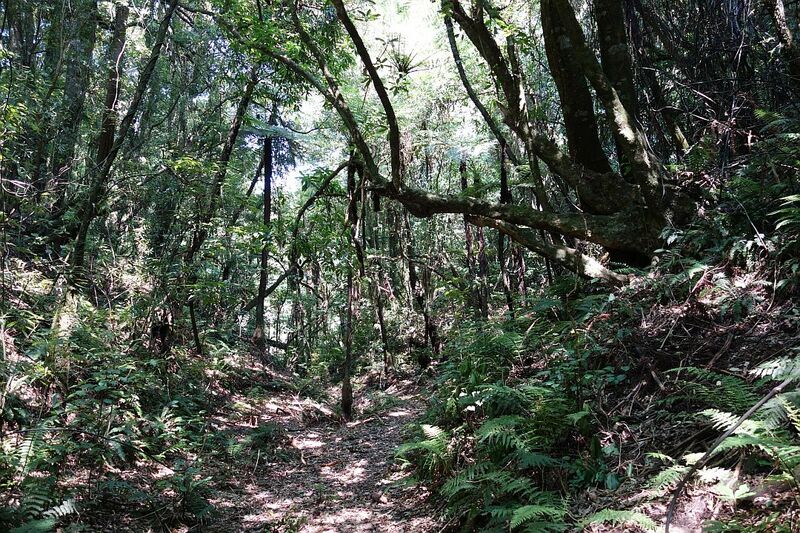 Most of the track is under cover of regenerating forest, with a selection of mature trees. This is along the ridgeline shortly after the climb from the track start. On the downhill section towards the Patotara crater. Patotara is a dry crater, almost flat, and with almost no trees. It is also known as “The Bullring”. The track follows the edge of the crater, to the right of the photo. 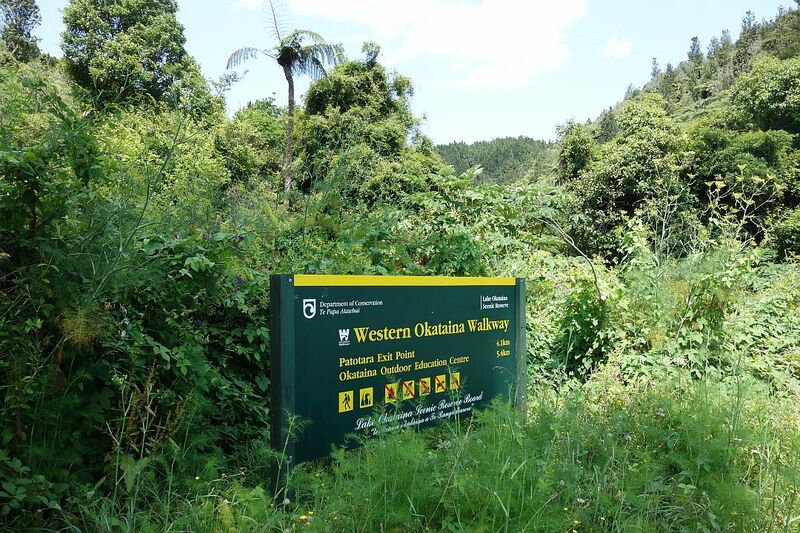 Near the Patotara exit point the Western Okataina Walkway continues as the Rongomai Track, past the Okataina Outdoor Education Centre to Lake Okataina. The Patotara exit point by Okataina Rd. 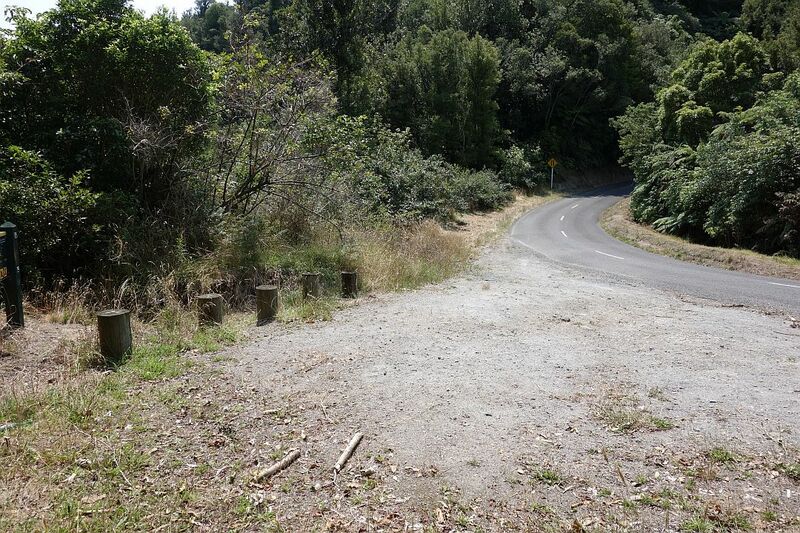 Instead of retracing the track back to the start on SH30, today’s walk continued back along Okataina Rd. Total distance on the walking track was just over 4 km, with a total time of just over 1 hour. The return along Okataina Rd added another 4 km, and about 1 hour of walking time. The GPS track log shows only the walkway part. The track was walked on February 7, 2015. 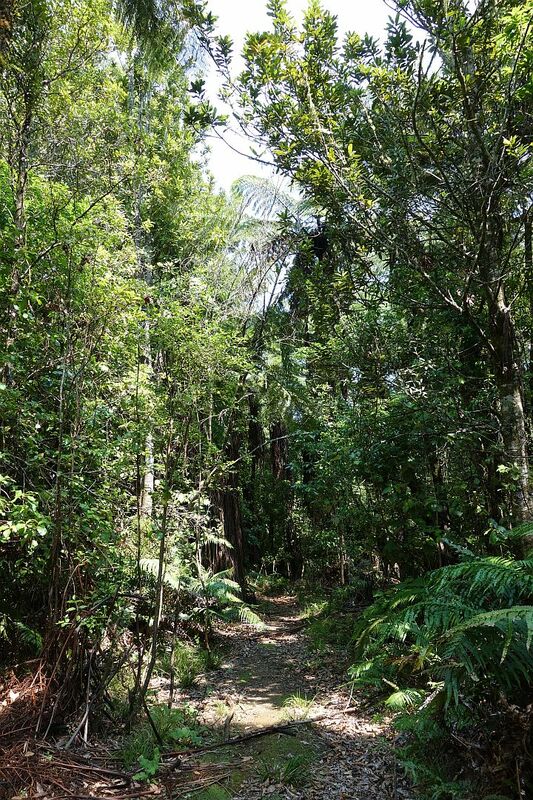 The same day as the Tarawera Ultra Marathon, an off-road run of up to 100 km from Rotorua to Kawerau, and using the Okataina Western Walkway from Millar Rd to Lake Okataina as part of the route.